When I first arrived in Colorado, I attended anything and everything cannabis-industry related. I was so thrilled to be in the mecca of the legal cannabis market! One of my first events was a product sample party for a soon-to-launch Denver cannabis dispensary. While most were busy sampling the dabbing concentrates, I went straight for the chocolate, pre-rolls, and granola bars. Needless to say, there were a handful of cannabis odds and ends that weren’t getting much attention. That’s when I saw a bottle that was simply labeled ‘Bath Soak’. 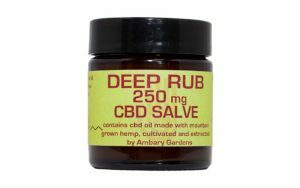 At the time, I was new to topicals and transdermal cannabis treatments, but hey, I’ll try almost anything once. The host of the party offered me the whole bottle to take home. I was much obliged. But the bottle sat in my bathroom for months. I would look at the label from time to time but never pick it up because I was weary it would even work. 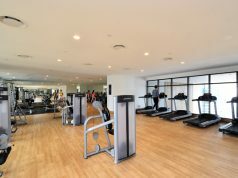 Finally, after battling residual pain from knee injuries as well as muscle soreness from hiking and the gym, I decided to give it a shot. Truthfully, I was out of bubble bath – that’s when decided I’d give the infused bath soak a shot. The product I tried was the Dixie Elixir brand 90mg Bath Soak. Instructions direct 2 – 5 ounces be dissolved in a warm bath. I use a generous 3 ounces in my bath. Each bath amounts to about a 10mg portion. 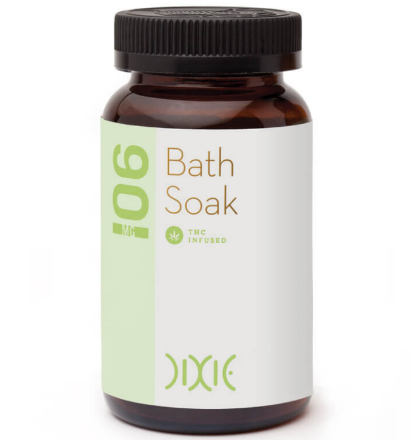 Aromatherapy and cannabinoid therapy all in one, the cannabis-infused soak also contains rosemary, lavender, and cedarwood. I prefer the CO2 extraction process used by Dixie, as opposed to using butane (BHO) because it gives me peace of mind that I’m not soaking in any residual elements left behind after extraction. The label suggests a 5-minute activation time. In my experience, it took about 20 minutes for my aches and pains to subside. The label also points out that “the intoxicating effects” could be delayed by two hours or more (which makes for a great sleep!). More about that later. 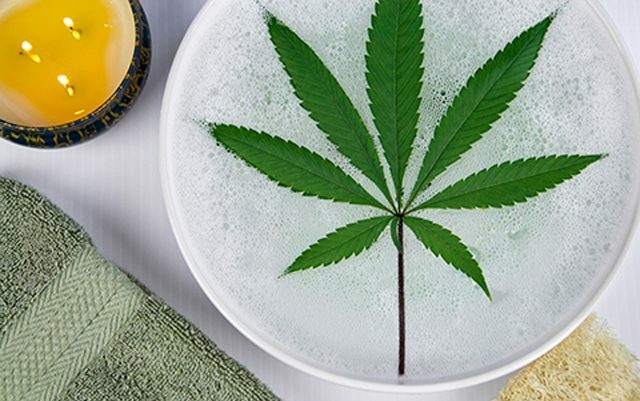 The first thing I tell people about my experience with cannabis-infused ointments and bath soaks is that you’ll know it’s working when you don’t feel anything. Now, that’s not to say that it turns your limbs numb or tingly. Instead, the baseline feeling of not being in pain means it’s working. I don’t spend more than a half hour in the bath soak. It only takes about that long for my joints throughout my legs and feet to feel relieved of pain. About two hours later, I feel an overall relaxed and tired feeling which makes it easy to drift into some of the best, uninterrupted sleeps of my life. For joint and muscle pain relief, I strongly suggest trying the cannabis-infused ointment, Rewind, by The Root of it All. The rub-on application method is easy, but make sure you’re not wearing your favorite white pants because the green hue of the ointment can transfer onto your clothes. The cannabis sativa-infused product also features the therapeutic properties of ayurvedic herbs; Turmeric, black pepper, and cloves. 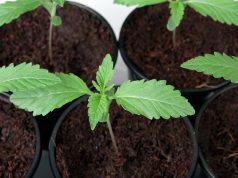 Not ready for cannabis? There are CBD-infused options. 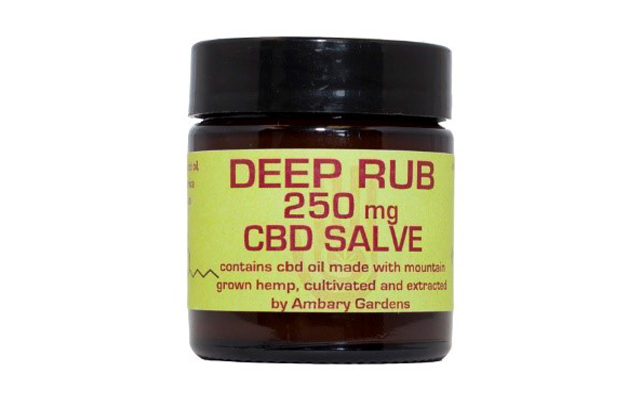 I cannot live in the dry climate of Denver without my CBD Deep Rub Salve by Ambary Gardens. For soft and healthy hands, I use their 250mg balm religiously, especially on my cuticles. Please check with your doctor and state’s laws on CBD and THC before obtaining these products. 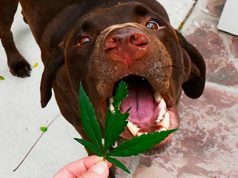 My recommendations are purely from my experience using the products and comparing them to other items on the market in Colorado. 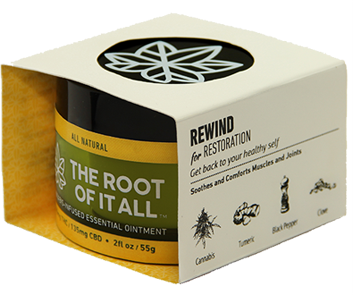 I’ve found relief in these products and plan to incorporate them into my life. That said, I think it’s important to write about my experiences with THC-infused therapeutic lifestyle products to normalize the self-discovery of safe and new cannabis therapies.